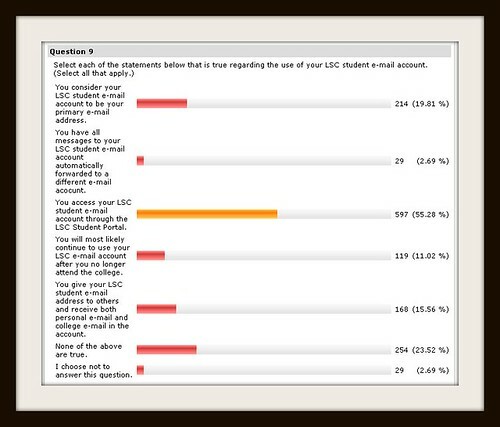 As we saw in a previous post, most students (87%) have one or more additional e-mail accounts besides their LSC student account. We’ve often speculated that many of the students automatically forward their LSC message to another account. Mostly wrong – only 2.7% of the students report doing this. About 80% of the students consider their school account to be a secondary e-mail account, not their primary account. That doesn’t surprise me at all. 11% say they will continue to use their LSC account after they leave the college. We have continuing conversations about whether we should give students a lifetime e-mail account in order to develop a more active alumni community and to keep some sort of tie to the college after they leave. Not sure how to read into the 11% figure. Not sure if that will be worth the effort. We may want to consider some sort of free option (Google, MS, etc) that allows them to keep an LSC e-mail addy without us having to manage their accounts on a regular basis. Again, we’ll see. The most surprising news to me was the fact that 55% access their e-mail account through the student portal. The portal is less than two years old and I wasn’t sure how much traffic was going through the portal since they can still access all the services (including e-mail) without going into the portal. The portal is intended to be a single sign-on, one-stop-shop for all of our e-services. Quite frankly I didn’t think that this number of students were using it on a regular basis (at least not yet). So that’s a good thing.